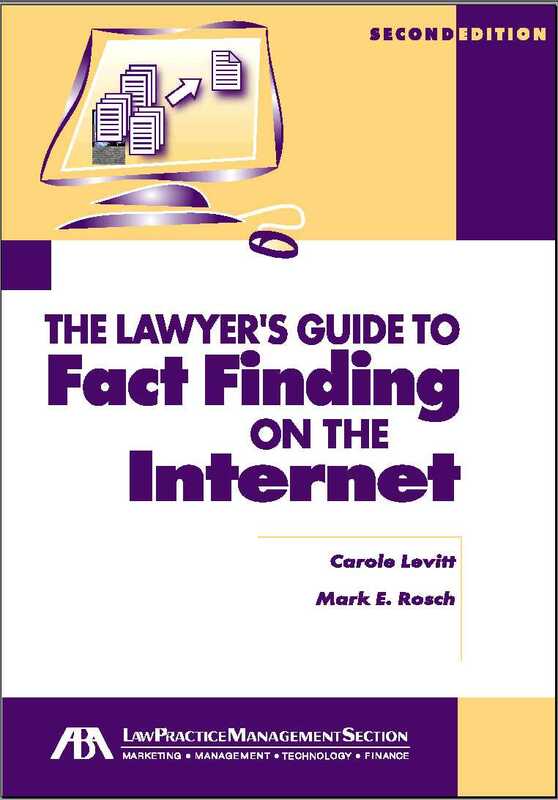 As President and founder of Internet For Lawyers (www.netforlawyers.com), she provides customized Internet legal research training to legal professionals (with continuing legal education credit). Ms. Levitt has made Internet legal research presentations at the LegalWorks and the LegalTech Technology Conferences, the annual meetings of the ABA, The National Association of Bar Executives, the Association of Continuing Legal Education and the California State Bar Association, the worldwide Gibson, Dunn & Crutcher corporate attorney retreat, and at law firms, bar associations and library associations throughout the United States. She is the regular contributor to the Los Angeles Lawyer magazines "Computer Counselor" column (reaching 25,000 attorneys throughout California) and has also written for the following magazines and newsletters: The Internet Lawyer, Computer and Internet Lawyer, Research Advisor, Nashville Lawyer, Bottom Line (The California State Bar LPM & T Section), as well as the following web sites: Internet For Lawyers, FindLaw, CEB Case N Point, and LLRX. Ms. Levitt is a member of the State Bar Associations of Illinois and California and the County Bar Association of Los Angeles. She is the Chair of the California State Bars Law Practice Management & Technology Section and also serves on the Executive Board of the Los Angeles County Bar Law Practice Management Section. Additionally, Levitt is a member of the Association of Continuing Legal Education (ACLEA). She served as the Vice-President of the 400-member Southern California Association of Law Libraries. Ms. Levitt received her Juris Doctorate from The John Marshall Law School, where she graduated with distinction and was a member of the school's law review. She earned her Bachelors in Political Science and her Masters in Library Science at the University of Illinois. Ms. Levitt can be contacted at clevitt@netforlawyers.com.